We’re proud to announce another new site release, for Joanne Cyr-Callaghan at Bristol Hearing Aids, a company serving the needs of people with hearing loss. Joanne has a growing business that needed a new, improved web site. Our custom design gave her a great look at a great price. Our professional design team took cues from Joanne, and developed a site that is clean, modern, and simple, yet contains the vital information her clients and potential customers are looking for. We also are developing a mobile version so folks can find her business easily on the go. 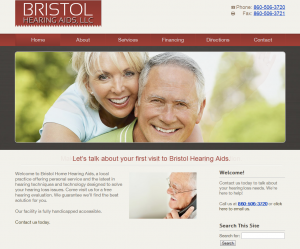 Check it out at www.bristolhearingaids.com! ← Themes vs. Custom Designs.